Picturesque setting with easy walk into town for general stores, antique shops, museum, pubs and tea rooms. Close to country park with castle ruins. 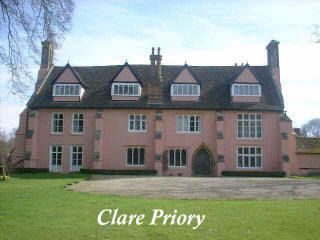 Steward John McPherson has once again arranged a tour of the Priory on Saturday afternoon. This was very popular last year and is sure to be well received. There is no charge but members are urged to make a donation in one of the boxes placed around the priory. Nearby: Long Melford, Cavendish and Kentwell Hall.